No time to waste; we’ve got a project ahead of us. We’ll start by mixing up a batch of pasta dough. Sift flour into a bowl or make a volcano on your countertop. Beat a few eggs with olive oil and water then pour into the flour. 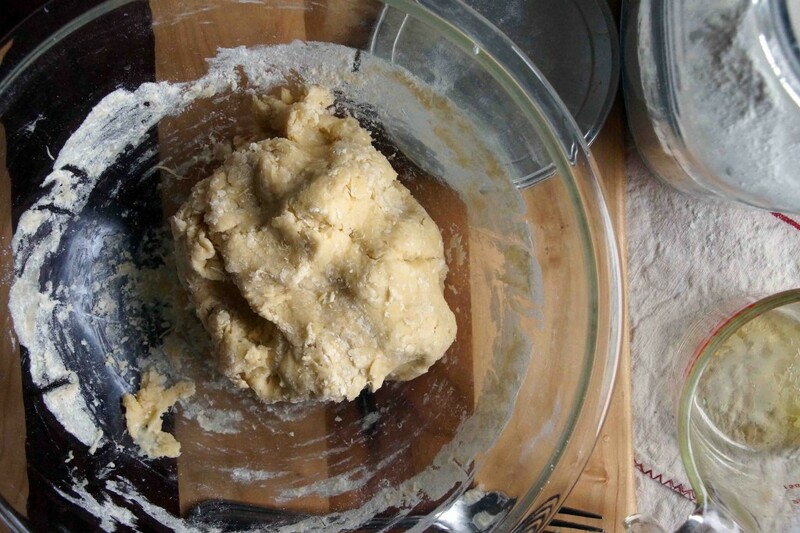 …until you’ve formed a scruffy looking ball of dough. 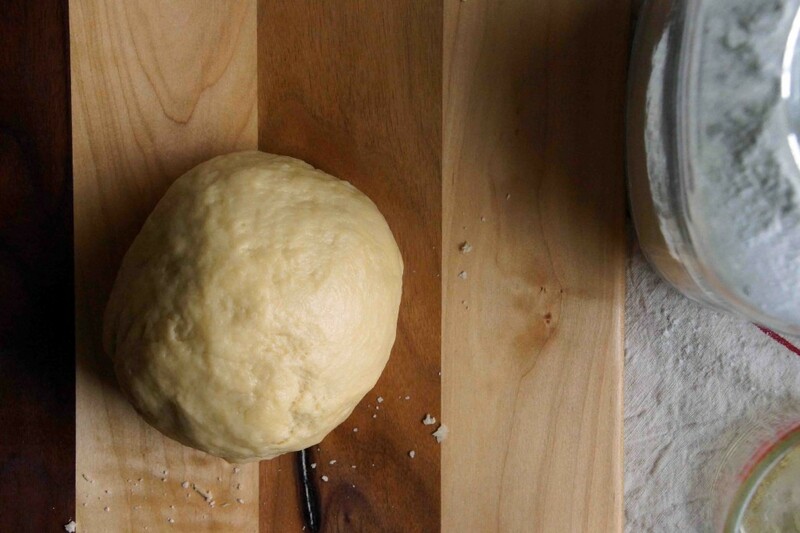 Turn it out and knead until smooth and elastic. Wrap the dough in plastic and let it rest while you tackle the ravioli filling and sauce. 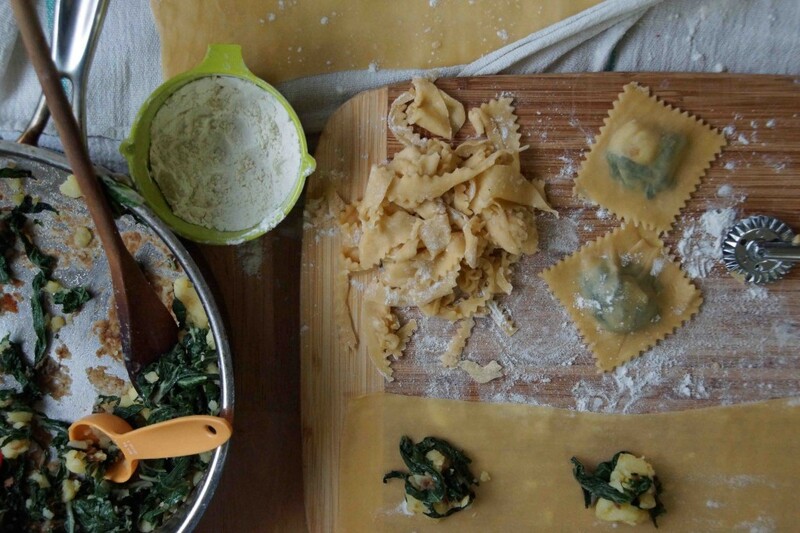 We’re stuffing our ravioli with garlicky Swiss chard and potatoes. Basically, we’re sticking one of my favorite side dishes between pasta sheets. If the carb on carb thing seems weird, just think about how well it works in pierogi or that tiella I made a while back. Blanch a big bunch of Swiss chard, boil and peel a couple of potatoes, and chop some garlic. It’s amazing how small a giant bouquet of chard becomes. Sauté the garlic in olive oil with a pinch of red pepper ’til it’s fragrant. 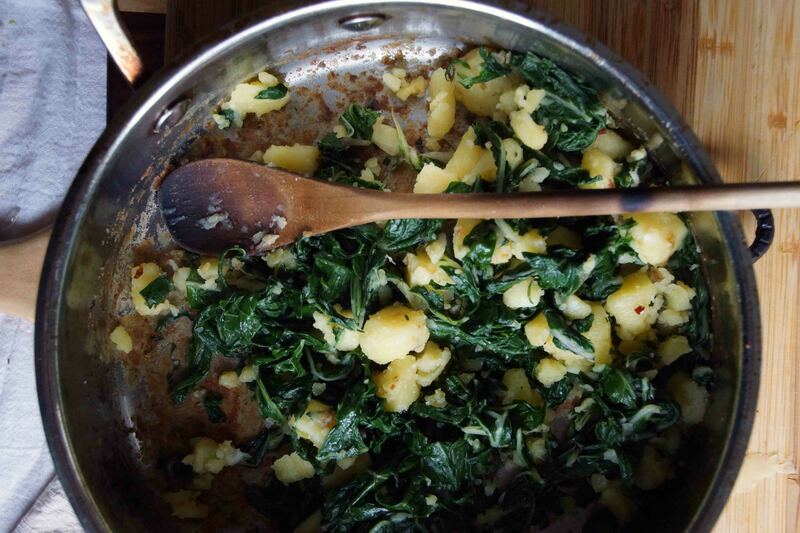 Add the chard followed by the potatoes and smash with the back of a spoon. 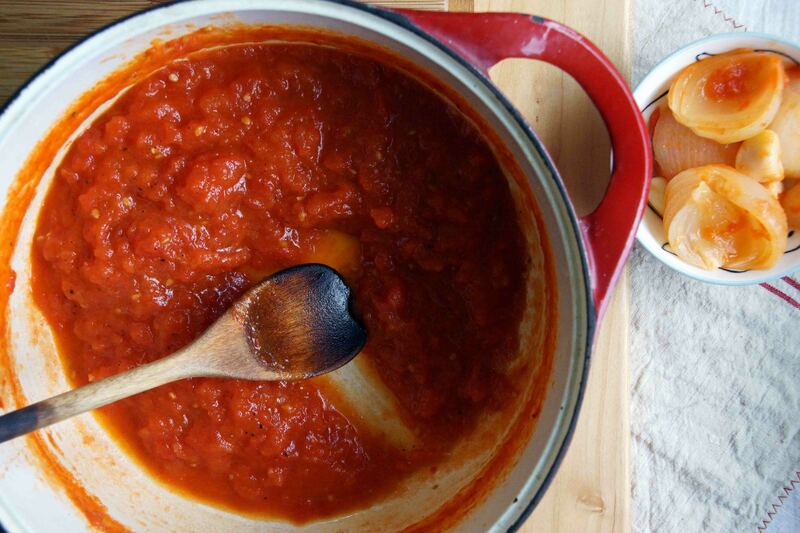 Let it cool while you get your tomato sauce working. 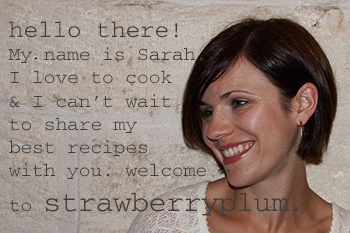 I’m taking advantage of summer tomatoes before it’s too late and making a really simple, fresh tasting sauce. 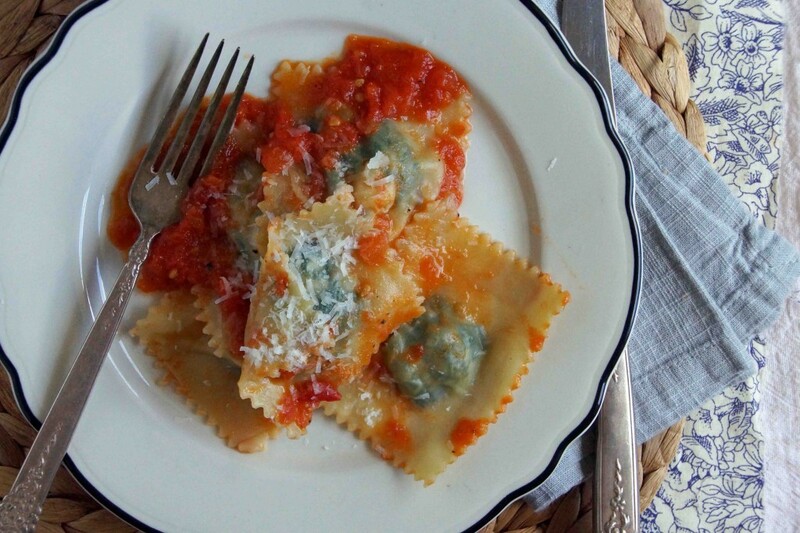 I think it’s important to keep sauces for filled pasta pretty simple; you don’t want a powerful sauce to take center stage while all the hard work that goes into forming ravioli gets forgotten. Peel a bunch of tomatoes. I used 10, but I also had extra sauce. 6 or 8 should do, but I like to overshoot and save any extras for dinner later in the week. I don’t quite remember when I learned to properly peel a tomato, I just remember being amazed. You just cut an X on the bottom and dip it into boiling water for 30 seconds or so. Pull it out and the peel slips right off. Cool! Core the tomatoes, remove the seeds, and finely chop. Heat a couple of tablespoons of butter or olive oil and sweat a couple of halved onions and a few smashed garlic cloves. We’ll take those out later, we just want them to subtly flavor our tomatoes. Add the tomatoes and let the sauce bubble while you shape the ravioli. Divide the dough in 6 pieces and pass each through a pasta roller, starting at the thickest setting and gradually working your way down to the thinnest. Lay the pasta sheets out on a floured towel until you’ve rolled them all and you are ready to start assembling the ravioli. Place 1/2-1 tablespoon mounds of filling, 2 inches apart on a sheet of pasta. Dip your finger in a bowl of water and outline a square around each mound of filling. Place another sheet of pasta over the top and press to seal. Cut into squares with a knife or rotary ravioli cutter and place on a floured towel until you’ve finished forming them all. Boil the ravioli in batches in a big pot of salted water until they’re floating on the surface and thoroughly cooked. Transfer them to the sauce. Divide between warm plates and dust with grated Parmesan. I love this kind of late summer/early fall eating. It’s on the light end of hearty, it feels good to back into “project” cooking, and the weather is just right for an after dinner stroll. Happy weekend! 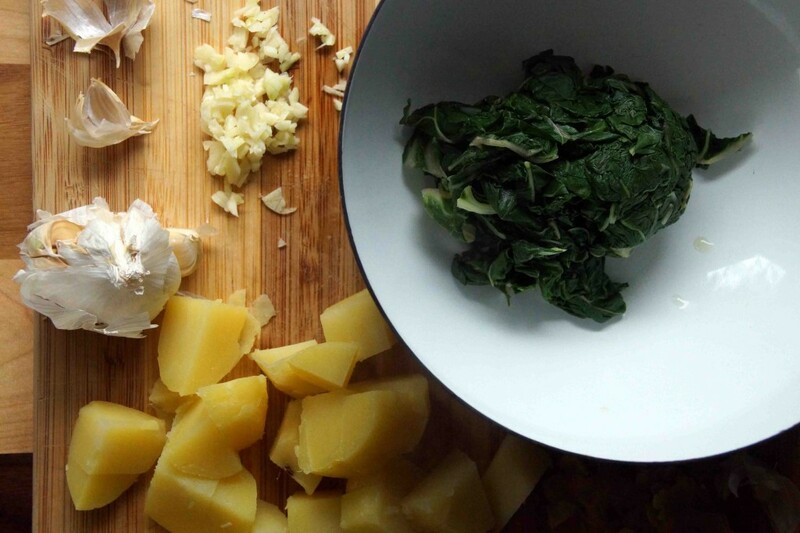 I fell in love with Swiss chard served with potatoes when I traveled to Croatia. 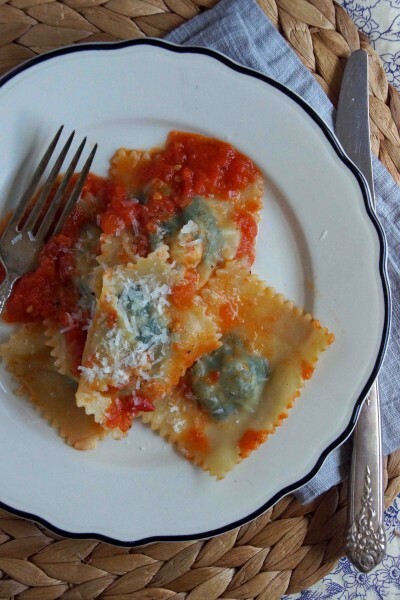 In this recipe, I've used the combination to fill ravioli and brightened it with a fresh tomato sauce. Bring a large pot of water to a boil. You will need this to first aid in peeling the tomatoes, second to blanch the chard, and finally to cook the ravioli. Place the potatoes in a small saucepan, cover with cold water, and bring to a boil. Reduce heat and simmer until the potatoes are tender, about 25 minutes. Meanwhile, make the pasta dough. 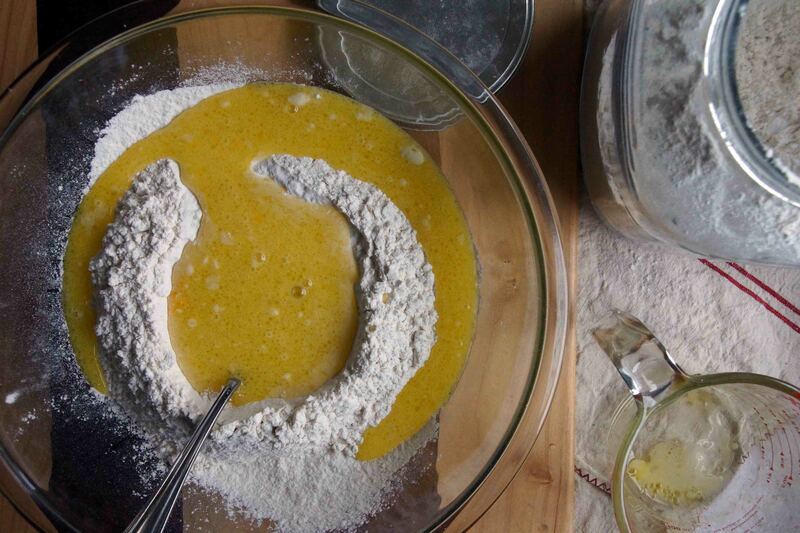 Sift the flour into a large bowl and create a well in the center. 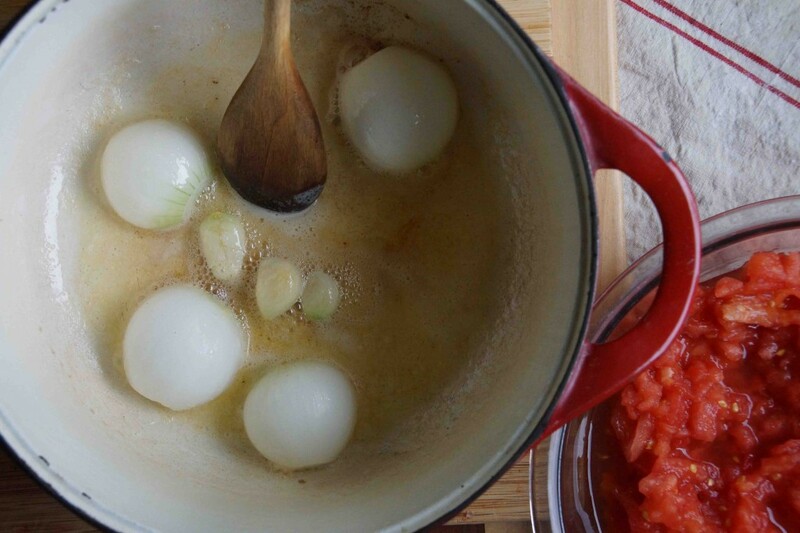 In a small bowl, whisk together the eggs, olive oil, and water. Pour the egg mixture into the flour well and use a fork to incorporate the wet ingredients into the dry until a rough ball forms. 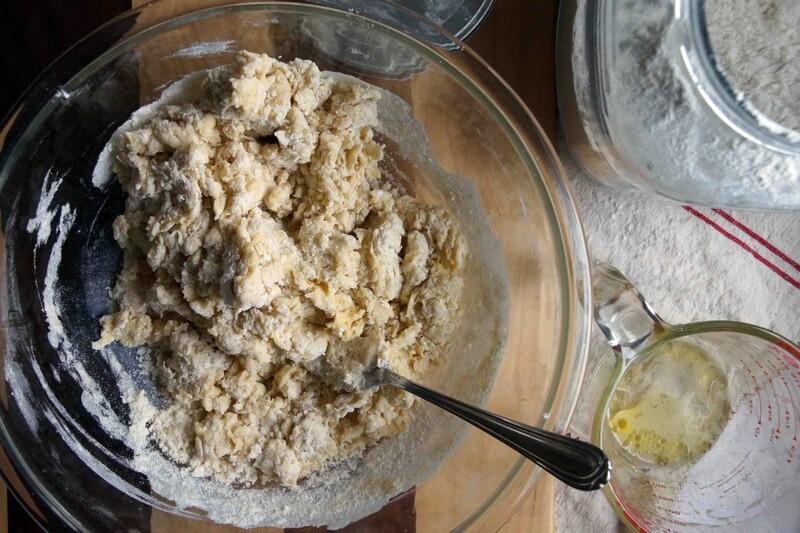 Turn the dough out onto a floured counter and knead until smooth and elastic, about 5 minutes. Wrap the pasta dough tightly in plastic wrap and allow to rest for 30 minutes-1 hour while you finish preparing the ravioli filling and start the sauce. Your pot of water should be boiling by now! 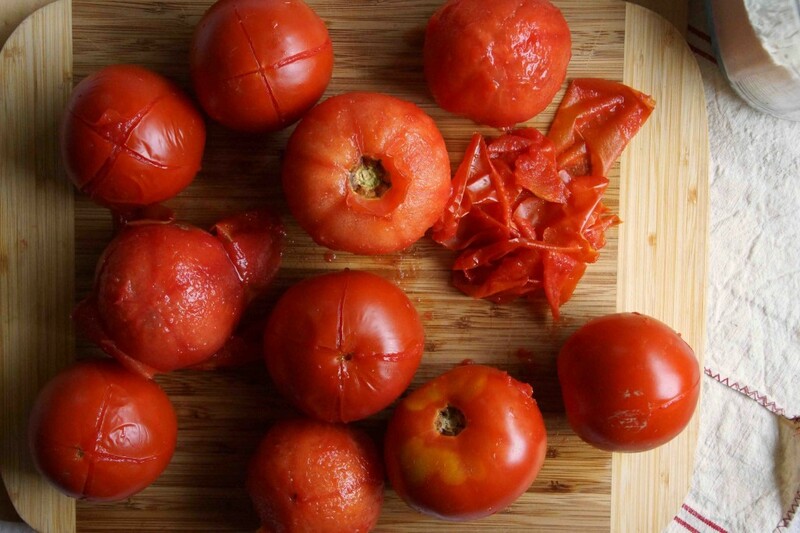 Cut an X through the skin of each tomato and plunge in the boiling water for about 30 seconds to loosen the skin. The skin should peel off easily and you can then proceed in coring, seeding, and chopping the tomatoes. Now salt the water and submerge the Swiss chard for about 30 seconds, until tender. 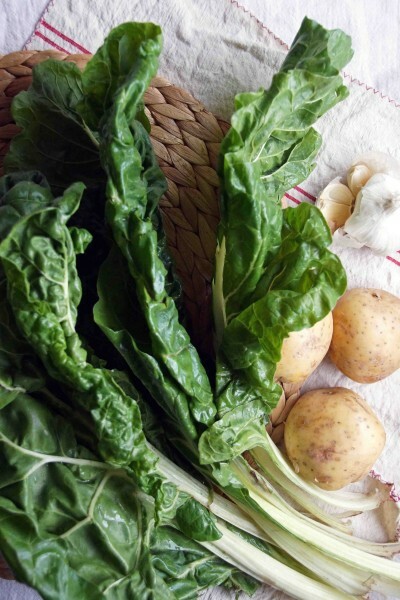 Remove the chard, place in a colander, and run cold water over it until it is cool and has stopped cooking. Wring out as much water as you can until you are left with a small, tight ball of greens. When the potatoes are cooked through, peel and chop in 1/2 in. chunks. Heat about 2 Tbsp. olive oil in a wide pan with the minced garlic and a few pinches of red pepper flakes. Add the chard and potatoes, season with salt, and sauté for 2-3 minutes until the flavors have melded. As you are sautéing, smash the potatoes a bit with the back of a wooden spoon. Taste. Season, as necessary, with salt and black pepper. Let the filling cool while you get the tomato sauce going. In a wide pot or Dutch oven, heat about 2 Tbsp. butter or olive oil with the onion halves and smashed cloves of garlic. Let the garlic get slightly golden then add the chopped tomatoes. Salt, bring to a boil, then reduce to a simmer. Simmer until the excess liquid has bubbled off and the tomato sauce is concentrated in flavor but still very fresh tasting, about 30 minutes. Remove the onions and garlic, season with salt and pepper. While the sauce is simmering, form the ravioli. Peel your boyfriend/husband/wife/kids off the couch and make them come help you! First, divide the dough in 6 pieces. Roll each piece through a pasta roller, starting at the thickest setting and gradually working down to the thinnest. Place the sheets of pasta on a floured towel until you've rolled all 6 pieces. To form the ravioli, place 1/2-1 Tbsp. mounds of the filling about every 2 inches along a sheet of pasta. Have a small bowl of water nearby. Dip your finger in the water and outline a square around each mound. Lay another sheet of pasta over the top and press to seal. 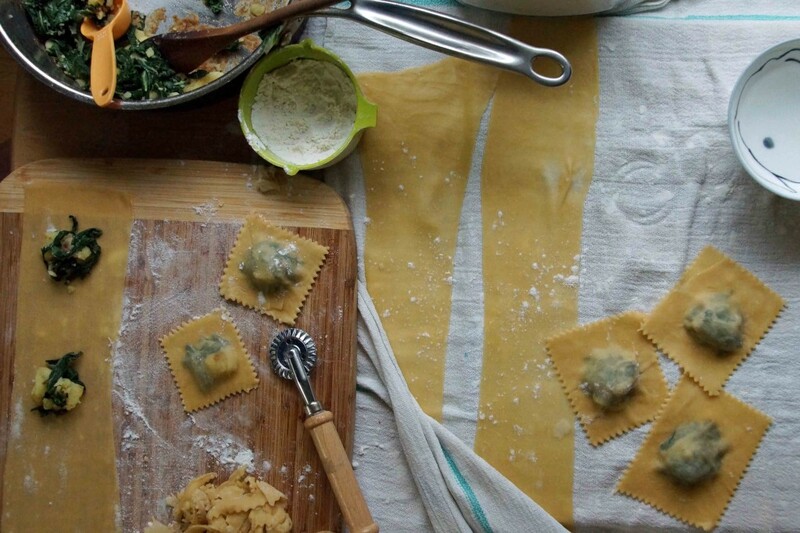 Cut into squares with a rotary cutter or knife and place the ravioli on a floured towel until you've finished forming them all. Cook the ravioli in 3 batches in abundant boiling salted water until the ravioli float and the pasta is cooked, 3-4 minutes. Transfer directly to the hot tomato sauce. Divide between warm plates or shallow bowls and top with grated parmesan, if desired.